Thanks to a fine sermon I heard last Sunday, all week I’ve been commiserating with Jonah. The belly of the whale is the perfect metaphor for how I’ve been feeling—as though I’ve been called do something, to say something, but my brain is refusing to cooperate. Here’s me as Jonah: white, heterosexual female—writer, Presbyterian elder, member of a “big-tent” church that welcomes LGBTQ people but isn’t yet comfortable addressing what full inclusion means. Scene 1: Me trying to write with elegance and authority about LGBTQ inclusion in the church. Scene 2: Me hunkered in the belly of the whale, thinking What do I know? Who am I kidding? Maybe it would be easier to keep sharing what other people write on Facebook? Jonah prayed while in the belly of the whale. He gave thanks and acknowledged that deliverance belongs to God, and then he got spewed out onto dry land. I no longer pray in the manner I was taught as a child. It’s “prayer” for me if I can just settle down and acknowledge the presence of a loving God. Scene 3: Me still hunkered like Jonah, but crocheting now, settling down. I’m crocheting a rainbow scarf to send to the General Assembly in June. I haven’t crocheted since the 70’s (granny squares! ), so I’ve been following a tutorial on YouTube. It’s slow going, but I hope to finish at least one scarf by Easter. I tug the multi-colored yarn from the skein, guiding it into the loops that catch hold and make a chain. As I work, the colors change and change again. It’s only one scarf. It’s only me here hunkered in the gloom of a wintry day. And yet it strikes me that this small effort on my part links me to something greater that shall not be broken. I understand now what they mean when they say we will “pray our way to the GA” this year. Though I will not be going to the GA, I’m praying my way—not with words but with a strand of yarn between my fingers. I picture my scarf delivered to Detroit in June. I picture it on the shoulders of someone who is pleased to receive it. Meanwhile I keep looping the yarn around the hook, around the hook again. In time the work of my hands will take the shape of a blessing. I’m with you, I call into the future. Love is love, and surely the church will bless gay and lesbian couples in marriage, because God has already blessed them. Scene 4: I write the above blog post. The End, I think. But wait . 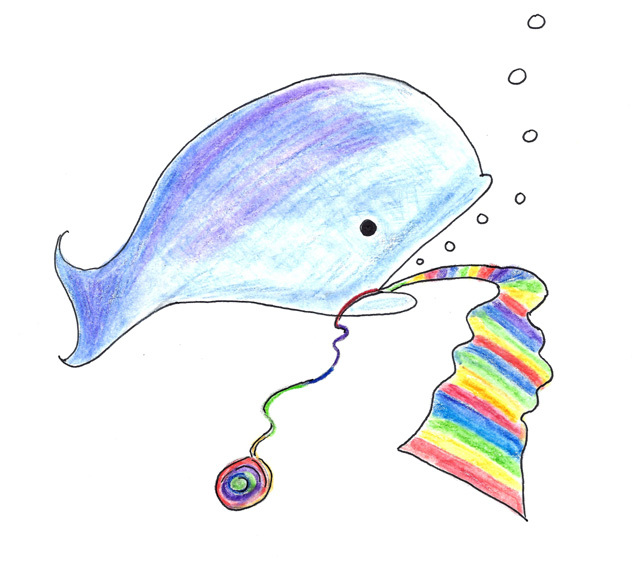 . .
Am I too comfortable with this picture I’ve just drawn of contemplative me, crocheting a rainbow scarf to send to the GA as a symbol of solidarity? Where exactly is Nineveh anyway? Could it be that Nineveh is the name of a boat I’m afraid to rock, the one holding the members of the church I love? Seated in that boat is an elder I served with on Session. A few years back this elder got wind that I was about to propose membership in More Light Presbyterians to our congregation. He took me aside to say that, though he respected me, he would fight against my proposal. Wouldn’t it be better, he asked, if we didn’t tear the church apart over this? My hands shook, and my tongue turned to cotton. I smiled hard (he was, after all, a friend—still is.) And in the end, I “agreed to disagree” rather than rock that boat—which is to say I turned away, angry and frustrated, and did not speak to him about it again. Scene 5: Still in the belly of the whale. Still thinking, crocheting, praying. Surely I’m not alone in here . . . Of course God’s here, but I’m talking about people. Madeleine Mysko serves on the MLP Editorial Board. An elder at Towson Presbyterian Church (Towson, MD), she is a published writer of poetry, fiction, personal essays, and opinion pieces. She is the author of Bringing Vincent Home, a novel based on her experience as an Army nurse during the Vietnam War. A graduate of the Writing Seminars of The Johns Hopkins University, she has taught creative writing for decades. She is also a registered nurse, and presently serves at American Journal of Nursing as coordinator of the “Reflections” column, a platform for personal stories. Her service on the editorial board of More Light Presbyterians stems from a desire to use her gifts in calling the church to be an openly welcoming community, and in demonstrating to others beyond the church what “welcoming” really means. All her posts for More Light Presbyterians can be found here. I loved your piece….I think you should rock that boat! But you might expect to be swallowed up again as I was. I am a heterosexual Presbyterian minister’s daughter, an RN whose specialty was Oncology but retired after 20 yrs due to disability. I asked my church (where I was a very weak infrequent attendee) with MLP, asking if they had ever considered becoming a MLP. Their response was to take me off the email list so I no longer got the minister’s mid-week message. I inquired about it,, asking if it was an error but go no answer … I finally got their message, so I do not attend there anymore. I live in Katy Tx and the closest MLP church is about 30+ mins from here. One day, I hope to get to one of them at least as I enjoyed having a church I felt comfortable attending. I no longer get AJN but would love to read some of your work. So good to find your good company here! I am sorry to hear that your church was not welcoming of your desire to BE welcoming, and that the closest MLP church is so far away. I have to say that my situation has been far happier. Though some members of my church are still uncomfortable talking about full inclusion of LGBTQ members (including marriage), I have never been made to feel unwelcome because I have a problem with their discomfort. I am a member of MLP primarily because it is here that I have found reasons to stay in my church, and to keep trying to remain in relationships–in other words to resist leaving the church (or organized religion altogether). Let’s stay in touch here, and see what we can do together. I, too, want to applaud your piece. I think there are many folks where you are. I am a straight woman Presbyterian clergy, and I am finding my voice more and more every day. I am serving an MLP church as an interim pastor right now. After years of trying to preach with integrity for myself and others, I am able to push the envelope a bit more. Oklahoma is a very conservative church. In the previous county we lived in, we could count the Democrats on fingers and toes. But I do believe that God is calling us forward. In fact, I think that is where we find God. . .when we begin to vision the future and move toward it. Yes, God is the God of the past, but God is not in the past any longer. And God is the God of today, but in a few brief hours, this day will fade away. God is the God of the future. The louder the voices are to cling to the past, the more I find myself venturing forth words and actions that hopefully lead is forward into a future where God waits with hope, promise, healing, love and more love. I will covenant with you that I will find my knitting needles, and get some rainbow yarn, and sit with you in the belly. We may still find ourselves sitting in the shade only to have a worm devour it, but soon we will be able to preach a word of repentance – the kind of repentance that turns the status quo on its head because they get they vision that is God’s vision. So let’s take a stitch, drink a bit of coffee, and be prepared to be vomited up on the shore so we can do what comes next. Sue, thank you for your comforting comments. I am so cheered by this covenant with you. When I am crocheting my rainbow yarn, I will think of you and your knitting needles. I smiled at your reference to Jonah under that nice shady arbor that suddenly withers and dies and ceases to provide shade! (I have tried several times to write a poem in response to part of Jonah’s travails, but that’s another story). I will think of you, too, at the point when I must be prepared to “do what comes next.” Perhaps I will be more composed and brave. Thank you for adding the word “repentance.” Yes! My Benedictine friend keeps telling me that I must remember it is not all about me, but all about God. It is not my opinions (about what is just) that I should argue. It is God’s justice I am hoping to reflect. It took me a week. But, I finally got a moment to read your post. I am so thankful I went back to read it. I sit with tears down my cheeks as I think of each loop you make with yarn. I think about the scarf I wore for my ordination and know that someone – I will never know – sat and did the same thing you are doing, praying with each stitch. So, thank you. Thank you for the post, thank you for the scarf, thank you for the conversations with your session. All that you do, it is enough – God has made it so. I am the lucky recipient and temporary guardian of the rainbow scarves that are being lovingly made for the upcoming GA meeting here in Detroit, in June. I get so excited with each box and package that arrives and look forward to reading the inspiring notes that accompany each shipment. Keep them coming!!! I look forward to meeting all of you who have created these beautiful works of art at GA. Thank you, Maggie. And thanks for the link to the Ruth Ellis Center. It was good to learn about the life and work of Ruth Ellis, and the work that goes on at the Center. My crocheting is rather uneven, but I hope that my scarf makes through your hands on its way to the General Assembly in June–a blessing!